The Silmarillion (Quenya: [silmaˈriliɔn]) is a collection of mythopoeic works by English writer J. R. R. Tolkien, edited and published posthumously by his son, Christopher Tolkien, in 1977, with assistance from Guy Gavriel Kay. The Silmarillion, along with J. R. R. Tolkien's other works, forms an extensive, though incomplete, narrative that describes the universe of Eä in which are found the lands of Valinor, Beleriand, Númenor, and Middle-earth, within which The Hobbit and The Lord of the Rings take place. 1977 George Allen & Unwin hardback edition. The cover features Tolkien's drawing of an heraldic emblem for Lúthien. After the success of The Hobbit, Tolkien's publisher requested a sequel. Tolkien sent them an early draft of The Silmarillion but they rejected the work as being obscure and "too Celtic". The result was that Tolkien began work on "A Long Expected Party", the first chapter of what he described at the time as "a new story about Hobbits", which became The Lord of the Rings. The Silmarillion comprises five parts. The first part, Ainulindalë, tells of the creation of Eä, the "world that is". Valaquenta, the second part, gives a description of the Valar and Maiar, the supernatural powers in Eä. The next section, Quenta Silmarillion, which forms the bulk of the collection, chronicles the history of the events before and during the First Age, including the wars over the Silmarils that gave the book its title. The fourth part, Akallabêth, relates the history of the Downfall of Númenor and its people, which takes place in the Second Age. The final part, Of the Rings of Power and the Third Age, is a brief account of the circumstances which led to and were presented in The Lord of the Rings. The five parts were initially separate works, but it was the elder Tolkien's express wish that they be published together. Because J. R. R. Tolkien died before he finished revising the various legends, Christopher gathered material from his father's older writings to fill out the book. In a few cases, this meant that he had to devise completely new material in order to resolve gaps and inconsistencies in the narrative. The Silmarillion, like Tolkien's other Middle-earth writings, was meant to have taken place at some time in Earth's past. 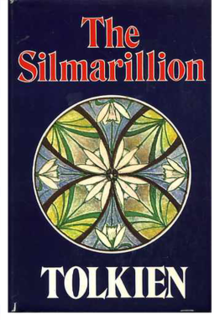 In keeping with this idea, The Silmarillion is meant to have been translated from Bilbo's three-volume Translations from the Elvish, which he wrote while at Rivendell. The inside title page contains an inscription written in Tengwar. In the English it reads "The tales of the First Age when Morgoth dwelt in Middle-earth and the Elves made war upon him for the recovery of the Silmarils to which are appended the downfall of Númenor and the history of the Rings of Power and the Third Age in which these tales come to their end." The first section of The Silmarillion, Ainulindalë ("The Music of the Ainur"), takes the form of a primary creation narrative. Eru ("The One"), also called Ilúvatar ("Father of All"), first created the Ainur, a group of eternal spirits or demiurges, called "the offspring of his thought". Ilúvatar brought the Ainur together and showed them a theme, from which he bade them make a great music. Melkor – whom Ilúvatar had given the "greatest power and knowledge" of all the Ainur – broke from the harmony of the music to develop his own song. Some Ainur joined him, while others continued to follow Ilúvatar, causing discord in the music. This happened thrice, with Eru Ilúvatar successfully overpowering his rebellious subordinate with a new theme each time. Ilúvatar then stopped the music and showed them a vision of Arda and its peoples. The vision disappeared after a while, and Ilúvatar offered the Ainur a chance to enter into Arda and govern over the new world. Many Ainur descended, taking physical form and becoming bound to that world. The greater Ainur became known as the Valar, while the lesser Ainur were called the Maiar. The Valar attempted to prepare the world for the coming inhabitants (Elves and Men), while Melkor, who wanted Arda for himself, repeatedly destroyed their work; this went on for thousands of years until, through waves of destruction and creation, the world took shape. Valaquenta ("Account of the Valar") describes Melkor and each of the 14 Valar in detail, as well as a few of the Maiar. It also reveals how Melkor seduced many Maiar – including those who would eventually become Sauron and the Balrogs – into his service. Quenta Silmarillion ("The History of the Silmarils"), which makes up the bulk of the book, is a series of interconnected tales set in the First Age that make up the tragic saga of the three jewels, the Silmarils. The Valar had attempted to fashion the world for Elves and Men, but Melkor continually destroyed their handiwork. After he destroyed the two lamps that illuminated the world, the Valar moved to Aman, a continent to the west of Middle-earth, where they established their home called Valinor. Yavanna created Two Trees that illuminated Valinor and left Middle-earth to darkness and Melkor. Soon after, stars created by Varda began to shine and the Elves awoke. The elves originally formed three groups: the Vanyar, the Noldor, and the Teleri, though some elves were captured and enslaved by Melkor, eventually to be bred into orcs. Knowing the danger the Elves were in, the Valar decided to fight Melkor to keep the Elves safe. After defeating and capturing Melkor, they invited the Elves to live in Aman. Many Elves travelled to Aman, while others refused and still others stopped along the way, including the Elves who later became the Sindar, ruled by the Elf King Thingol and Melian, a Maia. Of the three tribes that set out, all of the Vanyar and Noldor, and many of the Teleri reached Aman. In Aman, Fëanor, son of Finwë, King of the Noldor, created the Silmarils, jewels that glowed with the light of the Two Trees. Melkor, who had been held in captivity by the Valar, was eventually released after feigning repentance. Upon release, Melkor deceived Fëanor into believing that his eldest half-brother Fingolfin was attempting a coup against Finwë. This rift led to the banishment of Fëanor from the Noldor city Tirion, and Fëanor thereafter created the fortress Formenos to the North of Tirion. Finwë moved to Formenos to live with Fëanor, his favourite of three sons, and there they safely kept the Silmarils. After many years, Fëanor travelled to Tirion to make amends with Fingolfin, while Finwë stayed at Formenos. While making amends, Melkor destroyed the Two Trees with the help of Ungoliant, a dark spider spirit Melkor found in Avathar, on the Southeast side of Aman. Together, Melkor and Ungoliant then escaped to Formenos, killed Finwë, stole the Silmarils, and fled to Middle-earth. Melkor kept the Silmarils and banished Ungoliant, later attacking the Elvish kingdom of Doriath, ruled by the Elf King Thingol and his wife Melian. He was defeated in the first of five battles of Beleriand, however, and barricaded himself in his northern fortress of Angband. Fëanor and his sons swore an oath of vengeance against Melkor – and against anyone who withheld the Silmarils from them, even the Valar. Fëanor persuaded most of the Noldor to pursue Melkor, whom Fëanor renamed as Morgoth, into Middle-earth. Fëanor's sons seized ships from the Teleri, attacking and killing many of them, and left the other Noldor to make the voyage by foot. Upon arriving in Middle-earth, the Noldor under Fëanor attacked Melkor and defeated his host, though Fëanor was slain by Balrogs. After a period of peace, Melkor attacked the Noldor but was again defeated and besieged. Nearly 400 years later, he broke the siege and drove the Noldor back. After the destruction of the Trees and the theft of the Silmarils, the Valar created the moon and the sun. At the same time, Men awoke, some of whom later arrived in Beleriand and allied themselves with the Elves. Beren, a man who had survived the latest battle, wandered to Doriath, where he fell in love with the elf Lúthien, the king's daughter. The king sought to prevent their marriage by imposing what he believed an impossible task: retrieving one of the Silmarils from Melkor. But together, Beren and Lúthien embarked on this quest. Sauron, a powerful servant of Melkor, imprisoned Beren along the way; but with Lúthien's help he escaped, crept into Melkor's fortress, and stole a Silmaril from Melkor's crown. Having achieved the task, the first union of man and elf was formed, though Beren was soon mortally wounded and Lúthien also died of grief. However she convinced the Vala Mandos to revive Beren and herself, choosing to sacrifice her immortality in favour of a mortal life with her beloved. The Noldor, seeing that a mortal and an elf-woman could infiltrate Angband, perceived that Melkor was not invincible. They attacked again with a great army of Elves, Dwarves and Men. But they were deceived by Melkor, who had secretly darkened the hearts of many of the men. Thus it was that the Elvish host were utterly defeated, due in part to the treachery of some Men. However, many Men remained loyal to the Elves and were honoured thereafter. None received more honour than the brothers Húrin and Huor. Huor died in battle, but Melkor captured Húrin, and cursed him to watch the downfall of his kin. Húrin's son, Túrin Turambar, was sent to Doriath, leaving his mother and unborn sister behind in his father's kingdom (which had been overrun by the enemy). Túrin achieved many great deeds of valour, the greatest being the defeat of the dragon Glaurung. Despite his heroism, however, Túrin was plagued by the curse of Melkor, which led him unwittingly to murder his friend Beleg and to marry and impregnate his sister Nienor, whom he had never met before, and who had lost her memory through Glaurung's enchantment. Before their child was born, the bewitchment was lifted as the dragon lay dying. Nienor, realizing what grew within her, took her own life. Upon learning the truth, Túrin threw himself on his sword. Huor's son, Tuor, became involved in the fate of the hidden Noldorin kingdom of Gondolin. He married the elf Idril, daughter of Turgon, Lord of Gondolin (the second union between Elves and Men). When Gondolin fell, betrayed from within by Maeglin, Tuor saved many of its inhabitants from destruction. All of the Elvish kingdoms in Beleriand eventually fell, and the refugees fled to a haven by the sea created by Tuor. The son of Tuor and Idril, Eärendil the Half-elven, was betrothed to Elwing, herself descended from Beren and Lúthien. Elwing brought Eärendil the Silmaril of Beren and Lúthien, and using its light Eärendil travelled across the sea to Aman to seek help from the Valar. The Valar obliged; they attacked and defeated Melkor, completely destroying his fortress Angband and sinking most of Beleriand; and they expelled Melkor from Arda. This ended the First Age of Middle-earth. The last two Silmarils were taken by Fëanor's surviving sons Maedhros and Maglor. However, Maedhros killed himself by leaping into a fiery chasm with a Silmaril while Maglor threw his into the sea and spent the rest of his days wandering along the shores of the world, singing his grief. Eärendil and Elwing had two children: Elrond and Elros. As descendants of immortal elves and mortal men, they were given the choice of which lineage to belong to: Elrond chose to belong to the Elves, his brother to Men. Elros became the first king of Númenor and lived to 500 years old, being given an extended life in return for choosing to be a Man. Akallabêth ("The Downfallen") comprises about 30 pages, and recounts the rise and fall of the island kingdom of Númenor, inhabited by the Dúnedain. After the defeat of Melkor, the Valar gave the island to the three loyal houses of Men who had aided the Elves in the war against him. Through the favour of the Valar, the Dúnedain were granted wisdom and power and life more enduring than any other of mortal race had possessed, making them comparable to the High-Elves of Aman. Indeed, the isle of Númenor lay closer to Aman than to Middle-earth. But their power lay in their bliss and their acceptance of mortality. The fall of Númenor came about in large measure through the influence of the corrupted Maia Sauron (the chief servant of Melkor), who arose during the Second Age and tried to conquer Middle-earth. The Númenóreans moved against Sauron, who saw that he could not defeat them by force and allowed himself to be taken as a prisoner to Númenor. There he quickly enthralled the king, Ar-Pharazôn, urging him to seek out the immortality that the Valar had apparently denied him, thus nurturing the seeds of envy that the Númenóreans had begun to hold against the Elves of the West and the Valar. So it was that all the knowledge and power of Númenor was turned towards seeking an avoidance of death; but this only weakened them and sped the gradual waning of the lifespans to something more similar to that of other Men. Sauron urged them to wage war against the Valar themselves to win immortality, and to worship his master Melkor, whom he said could grant them their wish. Ar-Pharazôn created the mightiest army and fleet Númenor had seen, and sailed against Aman. The Valar and Elves of Aman, stricken with grief over their betrayal, called on Ilúvatar for help. When Ar-Pharazôn landed, Ilúvatar destroyed his fleet and drowned Númenor itself as punishment for the rebellion against the rightful rule of the Valar. Ilúvatar created a great wave, such as had never before been seen, which utterly destroyed and submerged the isle of Númenor, killing all but those Dúnedain who had already sailed east, and changing the shape of all the lands of Middle-earth. Sauron's physical manifestation was also destroyed in the ruin of Númenor, but as a Maia, his spirit returned to Middle-earth, no longer able to take upon himself the fair form he once had. Some Númenóreans who had remained loyal to the Valar were spared and were washed up on the shores of Middle-earth. Among these survivors were Elendil their leader, a descendant of Elros, and his two sons Isildur and Anárion who had also saved a seedling from Númenor's white tree, the ancestor of that of Gondor. They founded the Númenórean Kingdoms in Exile: Arnor in the north and Gondor in the south. Elendil reigned as High-king of both kingdoms, but committed the rule of Gondor jointly to Isildur and Anárion. The power of the kingdoms in exile was greatly diminished from that of Númenor, "yet very great it seemed to the wild men of Middle-earth". At the end, it is mentioned that the sunken Númenor came to be called "Atalantë", a name not used when it existed. This led many readers to the conclusion that Númenor is Atlantis; this direct link was, however, denied by Tolkien himself, who asserted that it's a natural word following the constructs of Quenya. The concluding section of the book, comprising about 20 pages, describes the events that take place in Middle-earth during the Second and Third Ages. In the Second Age, Sauron emerged as the main power in Middle-earth, and the Rings of Power were forged by Elves led by Celebrimbor. Sauron secretly forged his own ring to control the others, which led to war between the peoples of Middle-earth and Sauron, culminating in the War of the Last Alliance, in which Elves and the remaining Númenóreans united to defeat Sauron, bringing the Second Age to an end. The Third Age began with the passing of the One Ring to Isildur, who was ambushed at the Gladden Fields shortly afterwards, and lost the ring in the River Anduin. This section also gives a brief overview of the events leading up to and taking place in The Lord of the Rings, including the waning of Gondor, the re-emergence of Sauron, the White Council, Saruman's treachery, and Sauron's final destruction along with the One Ring, after which the ages of magic end. Tolkien first began working on the stories that would become The Silmarillion in 1914, intending them to become an English mythology that would explain the origins of English history and culture. Much of this early work was written while Tolkien, then a British officer returned from France during World War I, was in hospital and on sick leave. He completed the first story, "The Fall of Gondolin", in late 1916. He called his collection of nascent stories The Book of Lost Tales. This became the name for the first two volumes of The History of Middle-earth, which include these early texts. The stories employ the narrative device of a mariner named Eriol (in later versions, an Anglo-Saxon named Ælfwine) who finds the island of Tol Eressëa, where the Elves live; and the Elves tell him their history. However, Tolkien never completed The Book of Lost Tales; he left it to compose the poems "The Lay of Leithian" and "The Lay of the Children of Húrin". The first complete version of The Silmarillion was the "Sketch of the Mythology" written in 1926 (later published in Volume IV of The History of Middle-earth). The "Sketch" was a 28-page synopsis written to explain the background of the story of Túrin to R. W. Reynolds, a friend to whom Tolkien had sent several of the stories. From the "Sketch" Tolkien developed a fuller narrative version of The Silmarillion called Quenta Noldorinwa (also included in Volume IV). The Quenta Noldorinwa was the last version of The Silmarillion that Tolkien completed. In 1937, encouraged by the success of The Hobbit, Tolkien submitted to his publisher George Allen & Unwin an incomplete but more fully developed version of The Silmarillion called Quenta Silmarillion, but they rejected the work as being obscure and "too Celtic". The publisher instead asked Tolkien to write a sequel to The Hobbit. Tolkien began to revise The Silmarillion, but soon turned to the sequel, which became The Lord of the Rings. He renewed work on The Silmarillion after completing The Lord of the Rings, and he greatly desired to publish the two works together. But when it became clear that would not be possible, Tolkien turned his full attention to preparing The Lord of the Rings for publication. In the late 1950s Tolkien returned to The Silmarillion, but much of his writing from this time was concerned more with the theological and philosophical underpinnings of the work than with the narratives themselves. By this time, he had doubts about fundamental aspects of the work that went back to the earliest versions of the stories, and it seems that he felt the need to resolve these problems before he could produce the "final" version of The Silmarillion. During this time he wrote extensively on such topics as the nature of evil in Arda, the origin of Orcs, the customs of the Elves, the nature and means of Elvish rebirth, and the "flat" world and the story of the Sun and Moon. In any event, with one or two exceptions, he wrought little change to the narratives during the remaining years of his life. For several years after his father's death, Christopher Tolkien compiled a Silmarillion narrative. Christopher's intentions seem to have been mostly to use the latest writings of his father's that he could, and to keep as much internal consistency (and consistency with The Lord of the Rings) as possible, though he admitted that a complete consistency was impossible. As explained in The History of Middle-earth, Christopher drew upon numerous sources for his narrative, relying on post-Lord of the Rings works where possible, but ultimately reaching back as far as the 1917 Book of Lost Tales to fill in portions of the narrative which his father had planned to write but never addressed. In one later chapter of Quenta Silmarillion, "Of the Ruin of Doriath", which had not been touched since the early 1930s, he had to construct a narrative practically from scratch. The final result, which included genealogies, maps, an index, and the first-ever released Elvish word list, was published in 1977. Because of Christopher's extensive explanations (in The History of Middle-earth) of how he compiled the published work, much of The Silmarillion has been debated by readers. Christopher's task is generally accepted as very difficult given the state of his father's texts at the time of his death: some critical texts were no longer in the Tolkien family's possession, and Christopher's task compelled him to rush through much of the material. Christopher reveals in later volumes of The History of Middle-earth many divergent ideas which do not agree with the published version. Christopher Tolkien has suggested that, had he taken more time and had access to all the texts, he might have produced a substantially different work. But he was compelled by considerable pressure and demand from his father's readers and publishers to produce something publishable as quickly as possible. In October 1996, Christopher Tolkien commissioned illustrator Ted Nasmith to create full-page full-colour artwork for the first illustrated edition of The Silmarillion. It was published in 1998, and followed in 2004 by a second edition featuring corrections and additional artwork by Nasmith. During the 1980s and 1990s, Christopher Tolkien published most of his father's Middle-earth writings as the 12-volume The History of Middle-earth series. In addition to the source material and earlier drafts of several portions of The Lord of the Rings, these books greatly expand on the original material published in The Silmarillion, and in many cases diverge from it. There is much that Tolkien intended to revise but only sketched out in notes, and some new texts surfaced after the publication of The Silmarillion. These books also make it clear just how unfinished the later parts of The Silmarillion really were: some parts were never rewritten after the early versions in Lost Tales. The Silmarillion is a complex work exhibiting the influence of many sources. A major influence was the Finnish epic Kalevala, especially the tale of Kullervo. Influence from Greek mythology is also apparent. The island of Númenor, for example, recalls Atlantis. This, however, Tolkien later described in a letter to Christopher Bretherton as merely a "curious chance". Greek mythology also colours the Valar, who borrow many attributes from the Olympian gods. The Valar, like the Olympians, live in the world, but on a high mountain, separated from mortals; But the correspondences are only approximate; the Valar also contain elements of Norse mythology. Several of the Valar have characteristics resembling various Æsir, the gods of Asgard. Thor, for example, physically the strongest of the gods, can be seen both in Oromë, who fights the monsters of Melkor, and in Tulkas, the physically strongest of the Valar. Manwë, the head of the Valar, exhibits some similarities to Odin, the "Allfather". Tolkien also said that he saw the Maia Olórin (Gandalf) as an "Odinic wanderer". Influence of the Bible and traditional Christian narrative are seen in The Silmarillion in the conflict between Melkor and Eru Ilúvatar, a parallel of the polarity of Lucifer and God. Further, The Silmarillion tells of the creation and fall of the Elves, as Genesis tells of the creation and fall of Man. As with all of Tolkien's works, The Silmarillion allows room for later Christian history, and one draft even has Finrod, a character in The Silmarillion, speculating on the necessity of Eru's (God's) eventual Incarnation to save mankind. Medieval Christian cosmology shows its influence especially in the account of the creation of the universe as the manifestation of a sort of song sung by God with which the angels harmonize until the fallen angel introduces discord. St. Augustine's writings on music, as well as the extensive medieval tradition of the divine harmony—more familiar to us today in the notion of the "music of the spheres"—served as bases for this telling of creation. Celtic mythology show its influence in the exile of the Noldorin Elves, for example, that borrow elements from the story of Irish legends of the Tuatha Dé Danann. Welsh influence is seen in the Elvish language Sindarin, that Tolkien gave "a linguistic character very like (though not identical with) British-Welsh ... because it seems to fit the rather 'Celtic' type of legends and stories told of its speakers". At the time of release, reviews of The Silmarillion were generally mixed to negative. The Silmarillion was criticized for being too serious, lacking the light-hearted moments that were found in The Lord of the Rings and especially The Hobbit. Time magazine lamented that there was "no single, unifying quest and, above all, no band of brothers for the reader to identify with". Other criticisms included difficult-to-read archaic language and many difficult and hard-to-remember names. Robert M. Adams of The New York Review of Books called The Silmarillion "an empty and pompous bore", "not a literary event of any magnitude", and even claimed that the main reason for its "enormous sales" was the "Tolkien cult" created by the popularity of The Hobbit and The Lord of the Rings, predicting that more people would buy The Silmarillion than would ever read it. The School Library Journal called it "only a stillborn postscript" to Tolkien's earlier works. Peter Conrad of the New Statesman even went so far as to say that "Tolkien can't actually write". Nonetheless, a few reviewers praised the scope of Tolkien's creation. The New York Times Book Review acknowledged that "what is finally most moving is … the eccentric heroism of Tolkien's attempt". TIME described The Silmarillion as "majestic, a work held so long and so powerfully in the writer's imagination that it overwhelms the reader". The Horn Book Magazine even lauded the "remarkable set of legends conceived with imaginative might and told in beautiful language". John Calvin Batchelor, reviewing the book for The Village Voice, lauded the book as a "difficult but incontestable masterwork of fantasy" and praised the character of Melkor, describing him as "a stunning bad guy" whose "chief weapon against goodness is his ability to corrupt men by offering them trappings for their vanity". The Dutch progressive rock guitarist Jan Akkerman recorded a track called "The Silmarillion" on his 1977 album Meditation. The British neo-progressive rock band Marillion were formed in Aylesbury, England, in 1979 as Silmarillion but shortened their name in 1981 to avoid any trademark conflict. The Austrian black metal band Summoning formed in 1993 and have also released numerous concept albums based on this and other works by Tolkien. The German power metal band Blind Guardian released Nightfall in Middle-Earth in 1998, a concept album based upon The Silmarillion. The album contains not only songs but also spoken passages narrating parts of the story. The German Drum & Bass DJ Mathis Mootz released War of Sound in 2003, a clicks n' cuts side project as m2, which contains spoken word samples from an adaptation of The Silmarillion. The Irish Celtic metal band Cruachan released a song called the "Fall of Gondolin" on their 2004 album Pagan. The Australian indie band The Middle East incorporate many elements from The Silmarillion in their song "Beleriand" from their 2009 album The Recordings of the Middle East. The Swedish a cappella group Riltons Vänner incorporates loose influences of The Silmarillion in the lyrics of their song "Folket från Eä" (English: "The people from Eä"), written by Peter Sydén, from their 2005 album Här är passion. The Norwegian classical composer Martin Romberg has written three full-scale symphonic poems, Quendi (2008), Telperion et Laurelin (2014), and Fëanor (2017), inspired by passages from The Silmarillion. The works were premiered by orchestras in Southern France between 2009 and 2017. ^ Rayner Unwin (1978), in Amon Hen, bulletin of The Tolkien Society, no. 32 p. 13. ^ Fimi, Dimitra (August 2006). "'Mad' Elves and 'Elusive Beauty': Some Celtic Strands of Tolkien's Mythology". Folklore, 117(2), 156–170 . JSTOR 30035484. ^ Batchelor, John Calvin (10 October 1977). "Tolkien Again: Lord Foul and Friends Infest a Morbid but Moneyed Land". The Village Voice. Retrieved 13 February 2013. ^ "Martin Romberg at Orchestre régional Avignon-Provence". Orchestre régional Avignon-Provence. Wikimedia Commons has media related to The Silmarillion.